Alpine View Holiday Park & Motels is a large Christchurch accommodation complex 15 minutes south of Christchurch City. 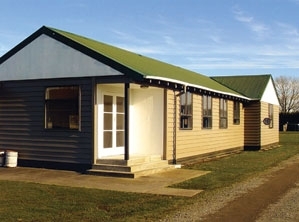 Accommodation options include Motel Units, Holiday Park with cabins and campsites, and a Backpackers Lodge. 10 ground and first-floor well-appointed 1 and 2-bedroom studio units with super-king and king-single beds. All units are noise proof with coffee/tea-making facilities, fridge, microwaves, toasters, hairdryers. 10 self-contained cabins with 1 and 2-bedrooms; 7 standard cabins. Some with TV and fridges. Standard cabin $60, self-contained cabin $100. 85 powered sites and 30 non-powered tent sites of varying sizes. Adventure playground available for guests. Tent/non-powered sites $25 per person, powered sites $35 for 1 person and $45 for 2 persons. 20 bed backpacker lodge - great for groups and group rates are available.